The hotel has 227 rooms. Novotel Budapest Centrum, a four-star-hotel located in the centre, can be found in the crossing of the Grand Boulevard and Rakoczi street. 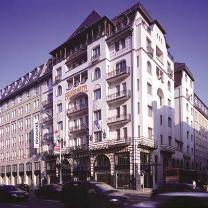 The extension of the renewed protected hotel building in the Art Nouveau style. Easy access from the cultural and commercial parts of the city. 227 air-conditioned rooms heat- and sound insulation, furnished according to latest Novotel style. All rooms have bathroom with bath (in the new wing with separate toilets) and with balconies in the old wing. Automatic extinguishing sets, electronic key-card system and safe deposit boxes. Office spaces, automatic wake up and voice mail boxes. TV -radio sets with 24 satellite and 4 pay-film and 6 music channels. 3 rooms provide total comfort for disabled guests with attached rooms for their companions. 12 connected rooms-for families 117 non-smoking rooms. Our restaurant offers dishes of both the French and Hungarian cuisine and a delicious breakfast-buffet. Permanent seasonal offers, excellent wineselection of Pannonia Hotels, children's meal. Lobby bar offers alcoholic and non-alcoholic mixed drinks, cakes, appetisers, unique coffee and tea. Room service an "early bird's" breakfast. Fitness room: Jacuzzi, Cardio, sauna, massage. Tourist Label: tourist programs and ticket services, rent-a car. Play-corner for children. Paying indoor hotel garage. Elegant brand stores. All major credit cards accepted. Pets welcome. 5 air-conditioned, soundproof meeting rooms approachable directly from the street. Efficient working spaces with right infrastructure. Tailored catering, maximum capacity: 400 people. Car - From Vienna, Balaton on the motorway Ml , M7 through the Erzsébet bridge direction centre as far as Blaha Lujza square.